Grant Armishaw and Hugh Mitton were at Ardmore to photograph the first public flight of the world’s only airworthy de Havilland Mosquito after its restoration. 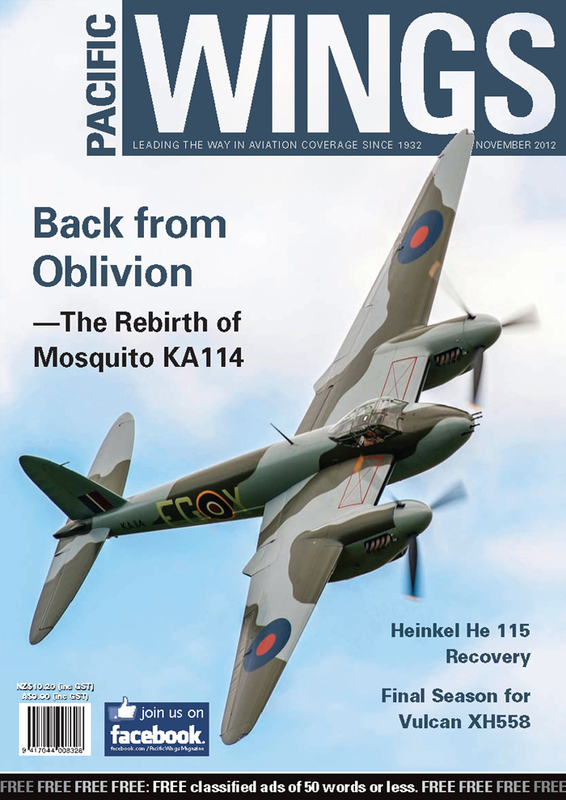 With the help of Grant and Hugh’s photographs, Pacific Wings celebrates the achievements of the team that restored KA114. Mark Sheppard tells the story of the recovery of a Heinkel 115 that sank after landing in Norway in December 1942. Earlier this year, Peter Cooper made a whistle-stop visit to the Spanish Air Force base of Gando to see the Spanish Air Force in action during a dissimilar air combat exercise. Paul Sortehaug continues his series of articles on New Zealand’s air aces with the story of Squadron Leader Stanley Franklin Browne. As a sad counter to the two restoration/recovery stories in this issue, Rob Neil explains why 2013 is likely to be the last time a Vulcan will ever fly. NZALPA’s president, Grant Kenny, believes it is long overdue for New Zealand to submit Justice Mahon’s Royal Commission Report into the crash of Flight TE901 to ICAO.